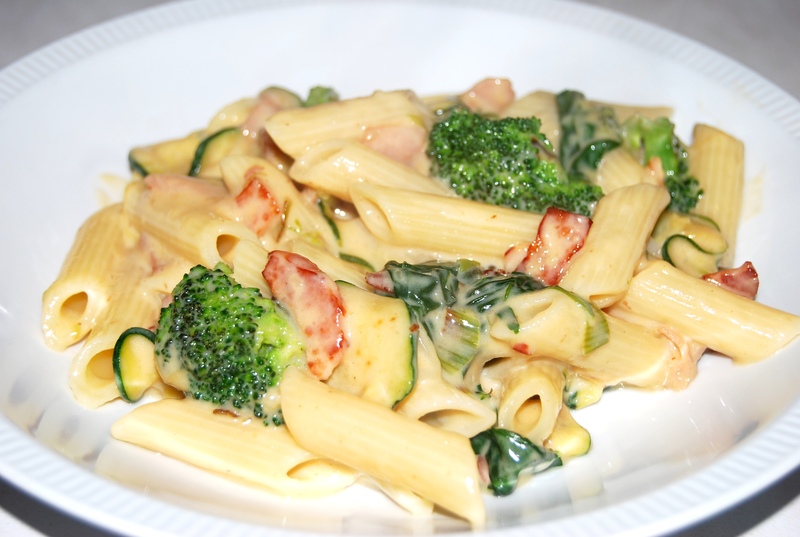 Traditional creamy pasta dishes are very high in fat and kilojoules. A healthy alternative to cream is reduced fat evaporated milk with a little added cornflour to thicken. By including a meat or meat alternative, this dish provides four of the five food groups. Heat oil in a fry pan. Add onion, garlic and bacon. Gently fry until bacon has browned. Bacon can be replaced with chopped chicken thigh or salmon (canned, fresh or smoked). To make this dish vegetarian replace bacon with tofu.